I have started up a Sims 4 challenge called the Legacy Challenge. In short, it’s a game challenge where you self-impose restrictions on your game play and follow certain rules for progression. In that way it’s very similar to the WoW Ironman Challenge. The Legacy challenge starts you off in poverty where your poor poor founder has to build a family following a set of laws for 10 generations. You fail the challenge if your sims are not able to produce an eligible heir. The link above explains it in detail. I had to choose a set of rules for what makes an eligible heir in my family. 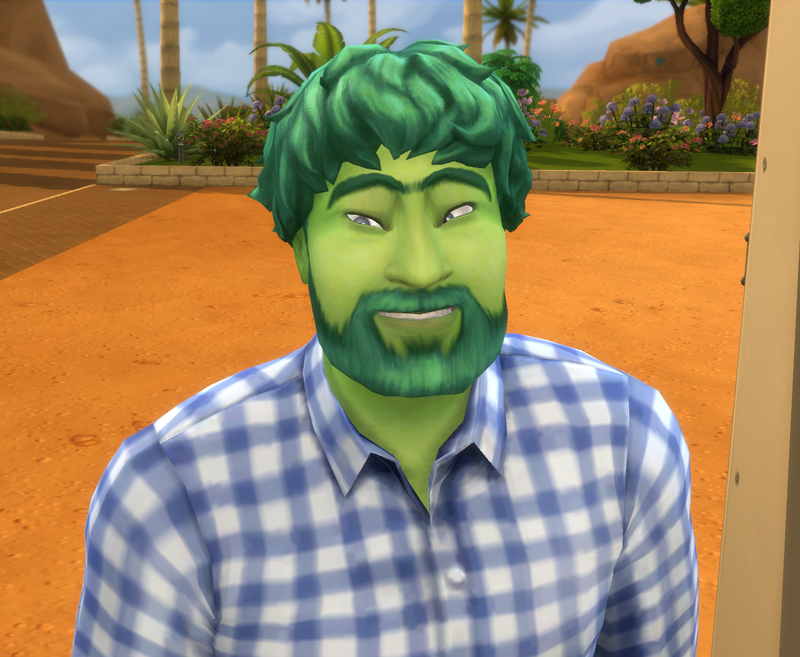 I went with a shrek-type founder, just a thoroughly good guy (family oriented, cheerful and nerd) and decided that I wanted the Jollygreen family to carry on their mark of green skin as the defining factor. I have chosen the following succession laws as described in the challenge rules. Gender Law – Equality: The Founder may be of either gender. Both boys and girls are eligible for the title of heir. Bloodline Law – Strict Traditional : To be eligible to be named heir, a child must be naturally born from their previous-generation parents and be able to trace an unbroken bloodline back to the founder. Adopted children may never be named heir. Heir Law – First Born: The oldest, by order of joining the family, eligible living child is named heir. Species Law – Xenophobic – Heirs cannot be a different species from the founder (green-skinned). To summarize, the only way for the Jollygreen family to carry on is for the previous-generation parents have a (nonadopted) child with green skin. If more than one child is born with green skin, it’s the oldest child who will be named heir. 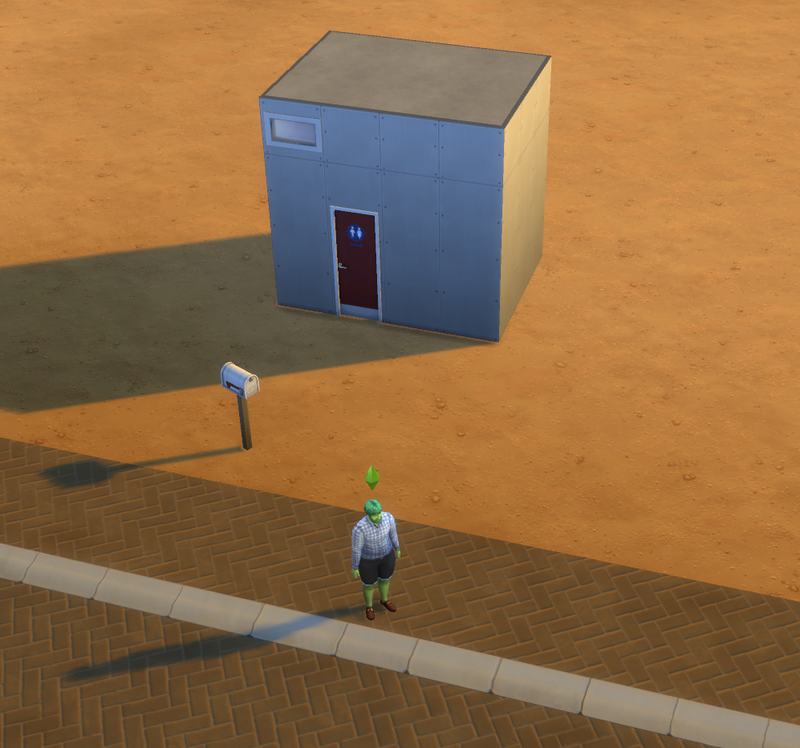 In the photo below we have good ol’ Papa Jollygreen, my founding father, very poor, living on the biggest lot in a public toilet in the desert town of Oasis Springs. Papa in front of his public toilet residence – it contains a bed, a toilet and a shower. That’s all he starts off with. Wish Papa good luck in ensuring his family’s legacy! This entry was posted on September 19, 2015 by Ironyca in The Sims and tagged Computer Games, Papa Jollygreen, The Sims 4, The Sims 4 Legacy Challenge, Unconventional Gameplay.